Oświęcim is a small industrial town of around 40,000. The camp Auschwitz-Birkenau was established on its outskirts, its name taken from the German name of the town. 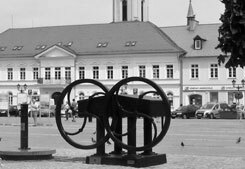 The 800 years of history of Oświęcim/Auschwitz, in the Middle Ages the administrative centre of an autonomous duchy, have since World War II been eclipsed entirely by the shadow of the camp’s history. There are several reasons why a look around the town of Oświęcim (Auschwitz) may prove a valuable supplement to the programme of an excursion to the Auschwitz-Birkenau site of memory. Auschwitz Jewish Centre is in the old part of Oświęcim, just over the bridge on the river Soła, between the medieval castle and the parish church. 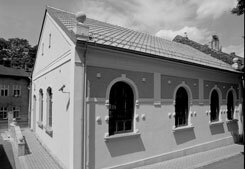 It occupies the Chevra Lomdei Mishnayot Synagogue. Marian Kołodziej was a prisoner in Auschwitz whose camp number was 432. 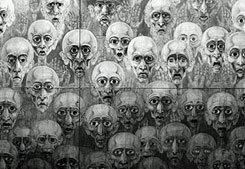 After the war Marian Kołodziej became an artist well known in Poland as a theatre and film set designer. For nearly fifty years he remained silent on the subject of his camp past, and made no reference to it in his artistic work.